PARIS: An asteroid described as a “pile of rubble” is rich in hydrated minerals that could help solve the mystery of how Earth got its water, scientists said Tuesday, reports AFP. The Ryugu asteroid, around 300 million kilometres (185 million miles) from Earth, is estimated to be between 100 million and one billion years old. It appears to have broken off from a parent body, according to observations from a Japanese probe that landed on the space rock. 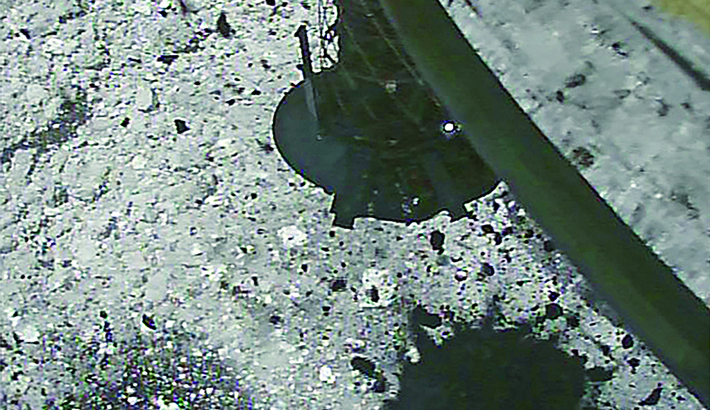 Kohei Kitazato, from The University of Aizu in Fukushima, told AFP that images taken by the Hayabusa2 craft showed that hydrated minerals—which contain traces of water in their crystal structure—were “ubiquitous” on Ryugu’s surface. Scans of the rock, which is shaped like a spinning top roughly 3.2 kilometres around its equator—about a 45-minute stroll—showed its interior to be highly porous.